Now, muffins versus cupcakes is a nearly epic battle. Are muffins just cupcakes without frosting that are generally eaten at breakfast? Are muffins just an excuse to eat cake for breakfast? It is something to ponder. Personally, I'm all about seeking sweetness in everyday life. In the late 1970's, Morning Glory muffins emerged from an oven in Nantucket Island. 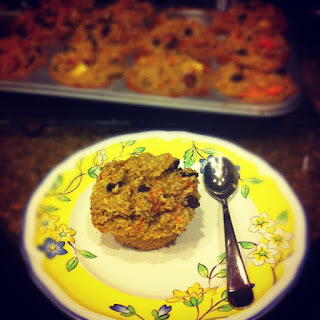 Back in the 1990's, Gourmet Magazine published a recipe for Morning Glory muffins in a "top 50 recipes" issue. Morning Glory muffins bring together fruits and vegetables. You have carrots, applies, and raisins, and you can even throw in some nuts. Coupling these ingredients with the spices, you get such tasty flavor to start the day. Butter, peanut butter, or jam are not needed, though I'm sure they would make a Morning Glory muffin tastier. While the Morning Glory muffin is full of great ingredients, muffins, especially for breakfast, are a little too heavy in carbs and usually have the pancake coma effect on me. A few months ago, I learned that my cholesterol was *slightly* high, which is likely attributed to genetics (thanks, Mom and Dad!). Keeping in mind that I'm a bit on the "type A" side, I immediately went out and bought a huge package of oatmeal from Costco. After all, oatmeal lowers cholesterol. 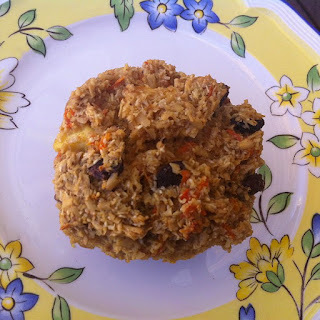 I decided to experiment and try combining the Morning Glory concept with baked oatmeal. Fruits, veggies, oatmeal, and nuts sounded like a good way to start the day. This recipe is similar in concept to the baked oatmeal with bananas and berries that I previously blogged about. This is all oatmeal and no muffin. This is a great breakfast to eat on the go! Preheat oven to 350ºF. Line a cupcake pan with cupcake liners; alternatively, you can lightly grease the cupcake pan. In a large bowl, combine the shredded carrots, diced apple, raisins, shredded coconut, and nuts. Set aside. In a medium sized bowl, combine the oats, flaxseed, cinnamon, nutmeg, allspice, baking powder, and salt. In a large measuring cup, lightly beat the eggs, then add the milk, vanilla extract, and coconut oil. Add the oats mixture to the large bowl, and stir to combine. Gradually, add the egg-milk mixture to the large bowl. Stir until combined. Evenly divide the batter and spoon the mixture into the prepared cupcake pan. Bake for 30 minutes or until the oatmeal is lightly golden. Allow to cool for about 10 minutes before removing. If you did not use cupcake liners, use an offset spatula to loosen and remove the baked oatmeal. *To keep this even healthier, I used coconut oil in lieu of butter, but you could substitute butter. How clever...now I can prepare everything the night before!! !